Simon & Schuster, 9781476792019, 240pp. A beautiful, “deeply affecting” (Kirkus Reviews) novel from the bestselling, award-winning author of Sister of My Heart and The Mistress of Spices about three generations of mothers and daughters who must discover their greatest source of strength in one another. Sweeping across the twentieth century, from the countryside of Bengal, India, to the streets of Houston, Texas, Before We Visit the Goddess takes readers on an extraordinary journey through the lives of three unforgettable women: Sabitri, Bela, and Tara. As the young daughter of a poor rural baker, Sabitri yearns to get an education, but schooling is impossible on the meager profits from her mother’s sweetshop. When a powerful local woman takes Sabitri under her wing, her generous offer soon proves dangerous after Sabitri makes a single, unforgiveable misstep. Years later, Sabitri’s own daughter, Bela, haunted by her mother’s choices, flees to America with her political refugee lover—but the world she finds is vastly different from her dreams. As the marriage crumbles and Bela decides to forge her own path, she unwittingly teaches her little girl, Tara, indelible lessons about freedom and loyalty that will take a lifetime to unravel. Told through a sparkling symphony of voices—those of the women themselves and the men who loved them—Before We Visit the Goddess captures the gorgeous complexity of these multi-generational and transcontinental relationships, showing the deep threads of love and hope and bravery that define a family and a life. This is a “gracefully insightful, dazzlingly descriptive, and covertly stinging tale [that] illuminates the opposition women must confront, generation by generation, as they seek both independence and connection” (Booklist, starred review). 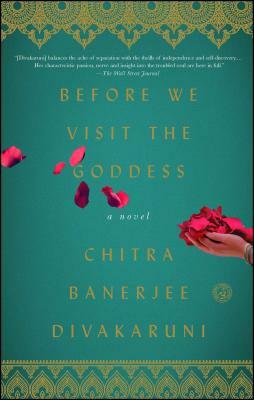 “The always enchanting and enlightening Divakaruni spins another silken yet tensile saga about the lives of women in India and as immigrants in America…Divakaruni’s gracefully insightful, dazzlingly descriptive, and covertly stinging tale illuminates the opposition women must confront, generation by generation, as they seek both independence and connection." “An extraordinary journey told through a sparkling symphony of male and female voices."